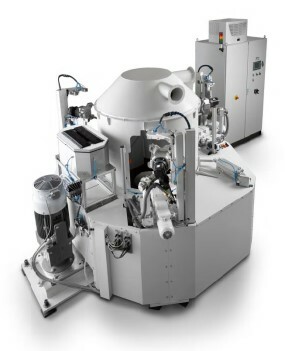 This new development of the company OTEC grinds and polishes workpieces especially well in areas, where conventional techniques like e.g. robots fail. Through the tremendous speeds of the grinding or polishing medium (up to 16 m/s), this machine is particularly suitable for processing of corners, recesses, grooves, etc.. In this process, the workpieces are held by special jigs and then immersed in rapidly flowing grinding or polishing medium. The process times are extremely short - just 1 to 3 minutes. For example at workpieces made of aluminum, the roughness of Ra 0.9µm can be reduced to Ra 0.05µm in just 1 minute through a single step dry process. During the process, the workpiece can be rotated or even angular movements can be performed. 本館專門提供 OTEC 表面處理技術皆集中於精密研磨,拋光, deburring, smoothing and polishing. 還有VTD PVD 超硬工具鍍膜 tool coating, 精密光學鍍膜 optical coating, 真空金屬鍍膜 metalization 和 absolute chemie PVD/CVD 退鍍工藝和 EMAG ECM / Precise Electrochemical Machining 精密電化學加工技術, EMAG 硬車削/乾式切削 hard turning, Koepfer 滾齒加工製造技術, Reinecker, KARSTENS外圓研磨+內圓曲面磨削, Naxos-Union曲柄軸研磨, 凸輪軸, KOPP非圓研磨, SW中心加工機, EMAG 雷射焊接, 自動化設備. 其它非相關資料純粹供同好分享.